Ralph Lauren is one of the most successful brands to come out of the American Fashion market. With over 50 years ruling the industry with iconic lines such as Polo Ralph Lauren which defined college prep, Purple label, the ultimate luxury experience, double RL, and many more. This year, Ralph Lauren celebrated his 50th Anniversary bringing 4 brands into one fashion show. In honor of his success and longevity, lets get to know the man behind the brand. 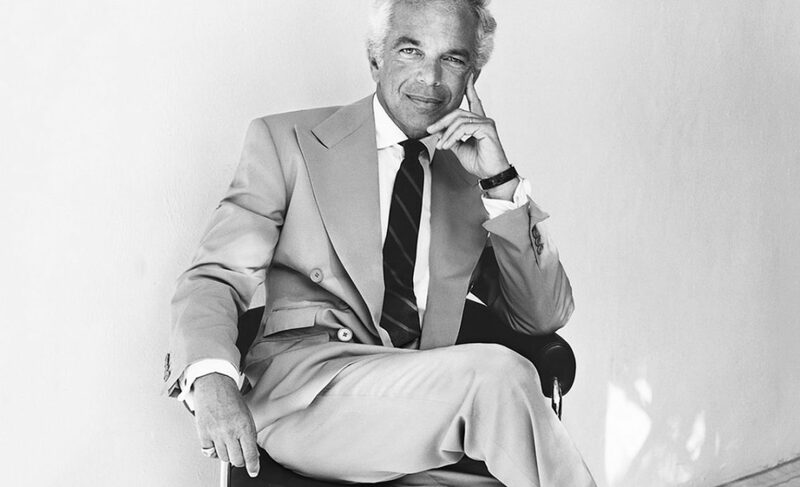 Ralph Lauren was actually born Ralph Lifshitz in New Your City, more precisely the Bronx, on October 14, 1939. He is one of 4 siblings of Parents Friede and Frank Lifshitz who were Askenazi Jewish immigrants having fled Belarus with the rise of the Nazi regime. Due to the last name causing problems in their younger age, his brother Jerry and Ralph changed their last name into Lauren at the age of 16 due to consistently being bullied in school. The young Ralph was known for his fashion sense at an early age, taking inspiration from screen Icons such as Cary Grant. His major interest lay in the looks of preppy wear as well as a strong focus on vintage wear, more commonly related to military and rustic looks. Ralph’s first encounter with business came at DeWitt Clinton High School, where he would sell handmade ties to his fellow students with a 10$ markup. After high school followed two years of military work in the U.S. Army reserves where he also took night classes at Brooklyn based Baruch College. There he studied business management and kept his sales high with his handmade ties. Afterwards, his career path turned him into a tie salesman at one of Americas most iconic menswear stores, Brooks Brothers. Having worked under the brand and with an ever increasing interest on designing his own neckwear, he did so with the Ivy prep style of Brooks Brothers in mind. Soon, as fashion progressed, he witnessed 1930s film star Douglas Fairbanks Jr. walking down Madison Avenue in a double breasted jacket and a spread collar shirt, which was completely different from the style at the time. Button down shirts, small ties have dominated the market in the 60s. Whilst Brooks Brothers refused Lauren to work and sell his own ties, he looked for alternatives having quickly received the invite to Beau Brummell, the famous tie boutique in New York. There, in their showroom in the Empire State Building, he was able to create and sell his own personal ties to customers. Don’t forget, he worked out of a drawer and a box in the late 60s. In 1967 with three children, Dylan, David and Andrew together with his Wife Ricky, he creates his brand under the same name, Ralph Lauren. After having such success with his ties with the name „Polo“, he builds what is to become his biggest fashion line with the iconic Polo player as logo. In an interview, he was asked, why he chose the Polo player as his logo despite never having played the game before. He replies „ My symbol was always a polo player because I liked sports.“ In another interview with Oprah he states „… and polo has a stylishness to it.“. He was absolutely right. In 1970 Ralph Lauren creates his first ever fashion line, two short years later in 1972 he introduced the world to something quiet remarkable. The short sleeved collard shirt with the iconic polo player, in short, Polo shirt. This made Ralph Lauren step into international light and 30 years later sees the brand expand on its fashion line creating, denim, perfumes, home accessories and the renowned luxury lines. Together with the polo player, Ralph Lauren stood also for another rememberable motif. With logos and prints on the „up“ in the late 80s, Ralph receives a gift. A Steiff teddy bear wearing a Ralph Lauren Polo. Being so intrigued in the Bear, he starts putting it on his knitwear line all across his collection marking another motive coexisting with the Polo player in 1991. Over the years, Ralph Lauren has created dozen of business under neath the name Ralph Lauren and now employs roughly 10,000 people across the world with a little below 400 stores world wide with an estimated revenue of 6.6 billion US$ in 2017. Now if that doesn’t say something… Ralph Lauren’s personal wealth is stated to be 7.1 Billion US$ according to forbes.com. With all his success over the years, Mr. Lauren never lost sight of his original goal. It was never about creating fashion but rather, creating style that he liked, that he wanted to portray and that worked for the people. Personally, after having seen his 50th Anniversary show, it is a still one of the best RTW brands in the world with styles such as classic with a modern twist, rustic with a countryside flair, luxurious and sporty. I would go as far as to say, it is a brand that you can get fully clothed in. A king is born, the king lives, long live the King.